Come and see the lovely leopard geckos whose photos grace our photo gallery. Leopard geckos are considered one of the best beginner reptiles, as they are quite docile, easy to care for, and don't require any special lighting. The Leopard Gecko Care Sheet has more on their specific care. Leopard geckos are very popular as pets because of many reasons - one being that they are so cute! 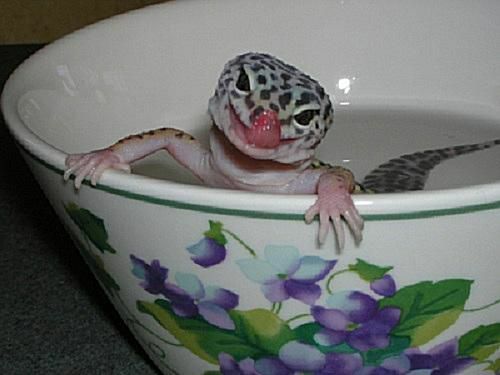 Geico is a leopard gecko who enjoys hamming it up for the camera. Leopard geckos can live to be over 20 years old! Learn more about leopard geckos here at their profile page. Leopard Geckos. Photo © 2006 Lianne McLeod, Licensed to About.com, Inc.
Leopard Gecko. Photo © 2006 Lianne McLeod, Licensed to About.com, Inc.